Few experiences match the excitement of watching a child's imagination embrace a new path and a Little Tikes Playhouse is a great catalyst. From the simple to the sublime, the selection of indoor and outdoor movable arenas inspires boys and girls alike. From garden cottages to log cabins, these playhouses provide backdrops sure to arouse creativity and provide hours of fun and make-believe. This venue is equally enjoyable alone or with playmates. The cozy retreat includes a built-in table and stool shaded by an awning, a realistic sink with a faucet and a Dutch door to let in visitors after they ring the working doorbell on the exterior wall. A lovely retreat available in a range of pastel colors, this large playhouse has a faux brick exterior highlighted by elegant columns and a working Dutch door. The lavish interior includes a sitting room perfect for setting up a child's tea set, fireplace, kitchenette, a phone to have imaginary conversations with friends and family and a trap door to add an air of mystery to the abode. 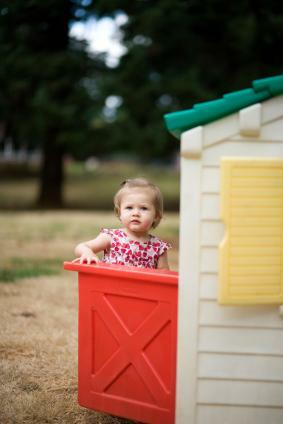 This versatile playhouse is easily movable and can provide hours of fun and entertainment indoors or outdoors. In addition to features like a mail slot on the Dutch door and working doorbell, a functional artist clip on the inside wall lets little artists showcase their work for all to enjoy. A built-in grill and serving window promote entertainment of guests, real or imaginary. For kids who embrace the pioneer lifestyle of the Old West, this rustic copycat cabin comes with a pretend fireplace, old-fashioned shuttered windows and a easy-to-operate Dutch door to welcome visitors. To "feed" the guests, the host can fire up the grill conveniently attached to a serving table. To accentuate the make-believe theme, a play phone is included to call for take-out if the grill is on the fritz. Whether musing about a prince or trying to escape an unscrupulous king or queen, this playhouse sports a realistic stone exterior and tower with a platform for watching over the kingdom. The make-believe fireplace has a secret door behind it and a built-in slide on one side to facilitate speedy escapes. Since playhouses are frequently set up in backyards, they naturally lend themselves to outdoor eating and entertainment themes. A combination of a climber and a playhouse, the serving table can be easily set up outside or moved inside if a rain shower threatens the picnic. The structure has a working light and Dutch door as well as climbing steps and a slide to add variety to the day's play. For the more affluent hosts, this picture window playhouse has a sophisticated kitchenette with a make-believe stovetop and oven surrounded by storage cupboards, a fireplace and a door with a mail slot. The 19-piece accessory selection includes pretend food, tableware and a toy phone. The doorbell next to the Dutch door that leads to the patio rotates six unique sounds to let the host know guests have arrived. If a single-themed playhouse is too limited, consider a Little Tikes Playhouse that has multiple rooms and premises interspersed with slides and climbers. This playhouse extravaganza has a 360-degree play arena with movable walls to accommodate groups of children and can be expanded to include several make-believe shops and businesses. The Town Center is a retail outlet where kids can display items for sale in the store windows, a gas station and automotive repair shop complete with tools, a café with a menu chalkboard, tables and chairs, refrigerator and sink and a canopy to shade diners from the sun. For a physical workout, children can visit the sports gym to toss around a ball, play soccer or hockey or shoot some hoops. This combination playcenter/playhouse includes a climber, slide and a kitchen with a large bay window. The deck, door and slide are big enough for use by older kids and adults. Easy to set up indoors or out, this playhouse inspires hours of role-playing and storytelling as children explore the "town" and visit the well-outfitted schoolhouse, fire station, grocery store and bank. They can fill up the car at the gas station pumps or get a workout at the multi-themed sports wall. Back home, they can wile away the hours in the workshop or kitchen. Doll lovers will delight in this playhouse/dollhouse combo that makes it easy to care for baby dolls while dressing up fashion dolls in extravagant outfits. Both units are large enough to add furniture and accessories and a handy door connects the houses. Storage drawers, a whirlpool tub, doll high chair, stovetop, toy phone and storage doors are included. Whether you choose a simple cottage or full-blown town-type playhouse to entertain a child, the resulting magic will infuse the atmosphere with wonder. As you witness a child create characters and scenarios, you may be inspired to revisit some lost dreams of your own.